Stuff floods in through the mail. It multiplies in shared workspaces. “You’ve got mail!”” Oh happy day! 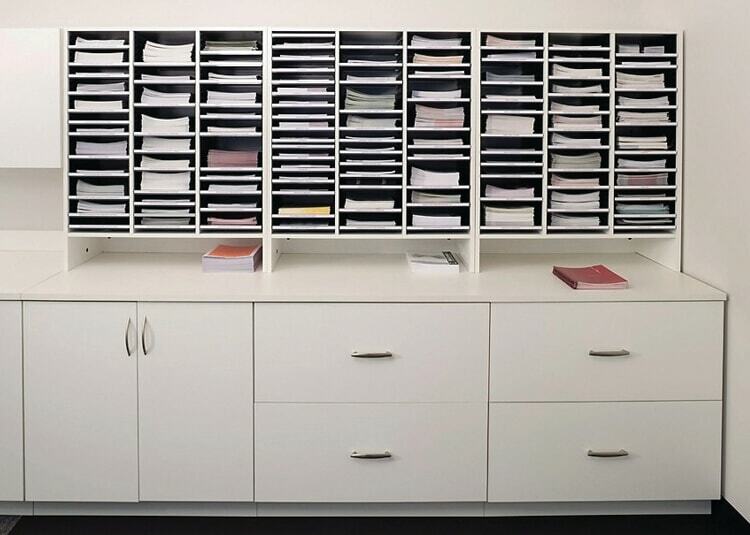 Only with so much mail coming in and out of your organization, it can be difficult to organize and manage it all. 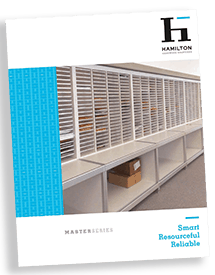 Check out our brochure of console and modular options to efficiently send and sort. 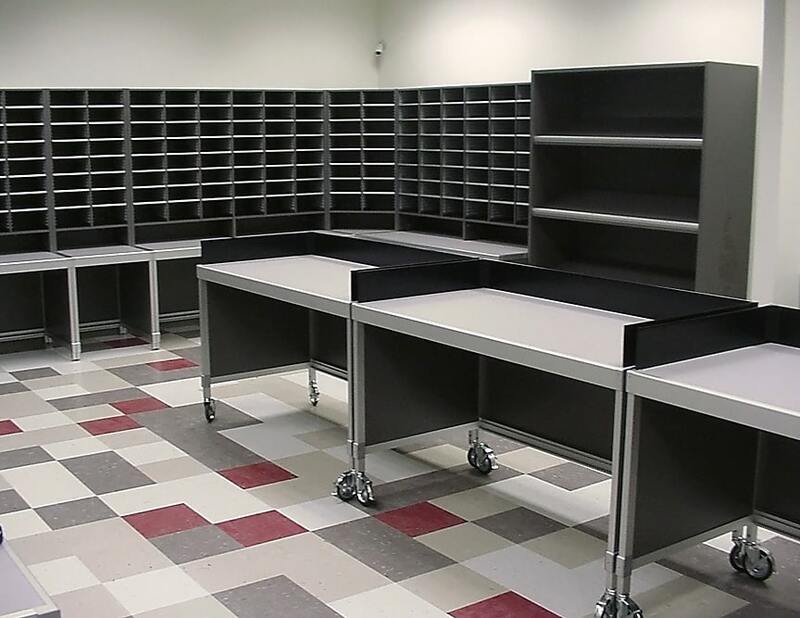 Here’s a quick overview of the Patterson Pope line of Mailroom Furniture. 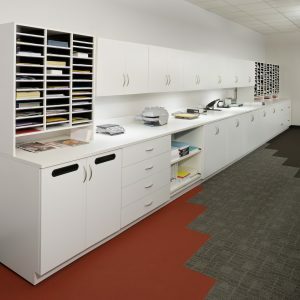 Please contact us to learn more about mail storage and to start discussing how to make the best use of your space. 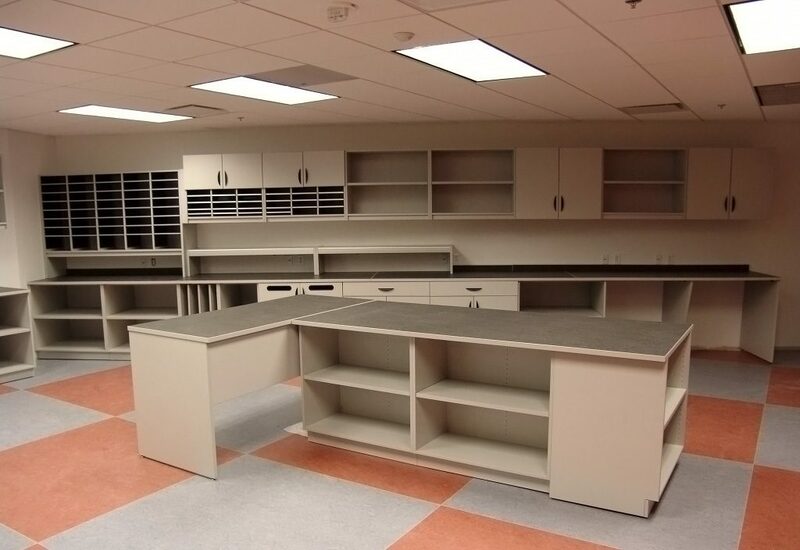 From back room work environments all the way up to the executive suites, we have consoles and work surfaces that are built to last and are aesthetically pleasing. Talk about a winning combination. 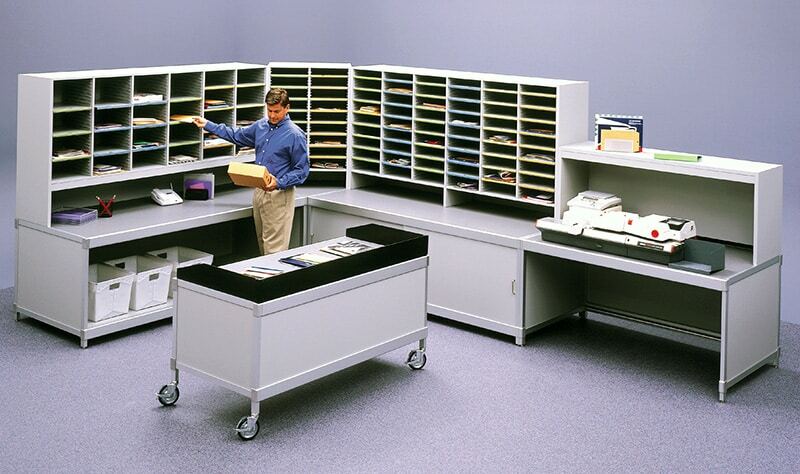 Aluminum consoles provide durable work surfaces and storage options for supporting mailing equipment or sort modules. 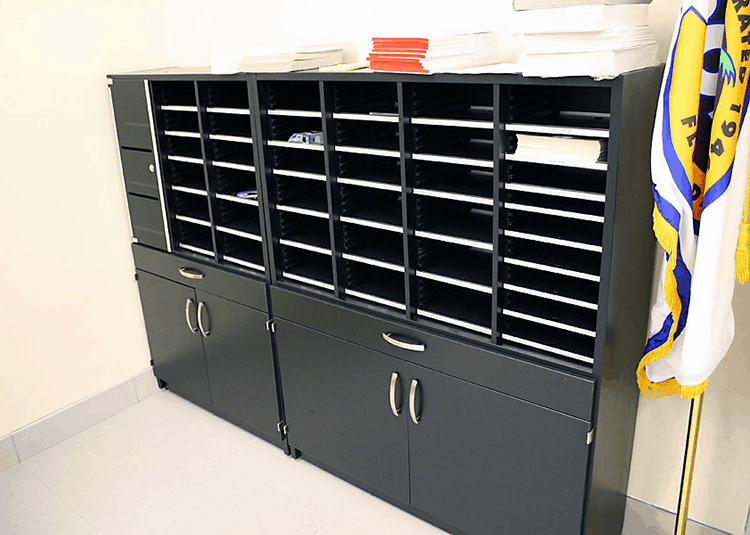 They are available with a wide range of shelf and mail storage options, and a built-in track to securely lock sort modules in place. 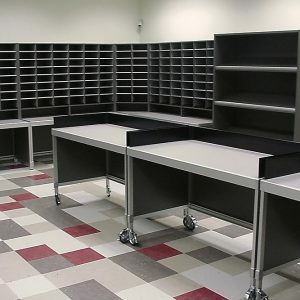 Mailroom technology and equipment is supported by work surfaces calibrated to the precise height required for stress free operation. 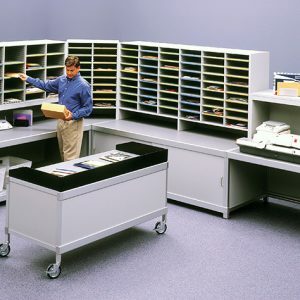 Aluminum framed consoles are designed for the toughest work environments. Our exclusive aluminum extrusions surround all vertical and horizontal surfaces and can’t chip or dent like painted metal. And designers appreciate the continuity of the ergonomically detailed work surface edge, an uninterrupted design element that protects and connects adjacent consoles. 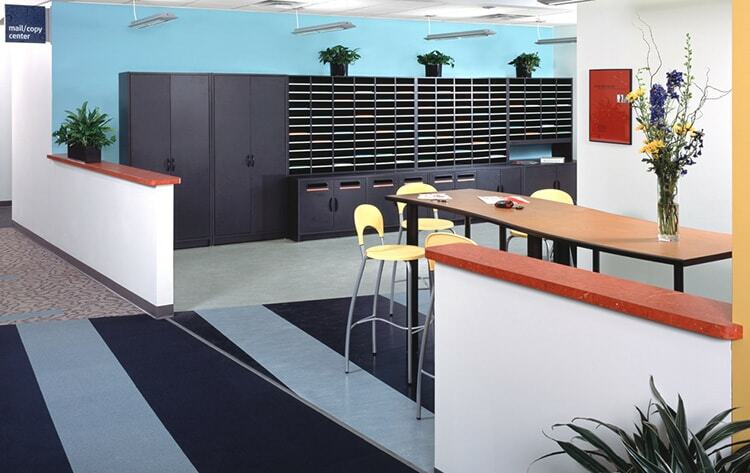 For applications where the details and finishes of millwork construction are required, we offer laminate console bases in a range of standard or designer-specified finishes. 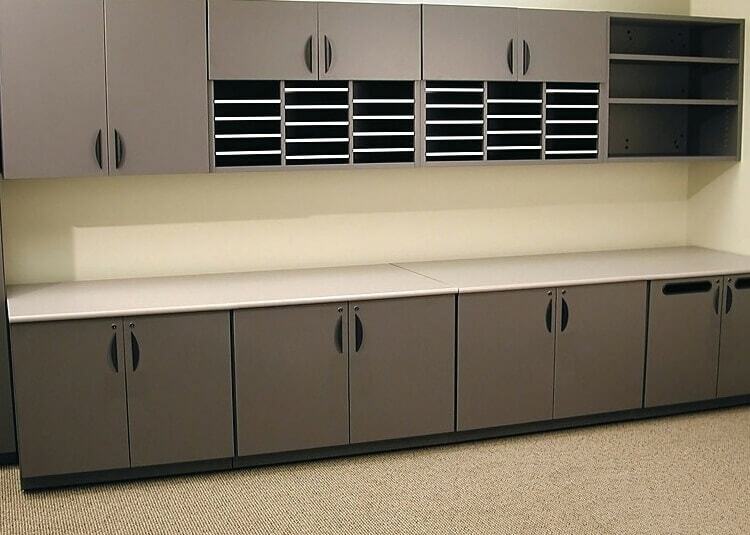 Sort Modules are available in standard heights up to 48 in. 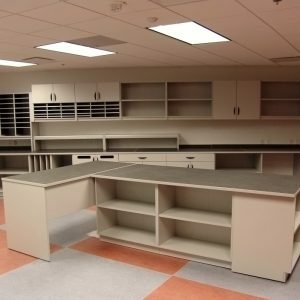 with closed, transparent or open backs and options such as platform bases and clear doors for security. Sort Modules lock into consoles or can be wall-mounted. 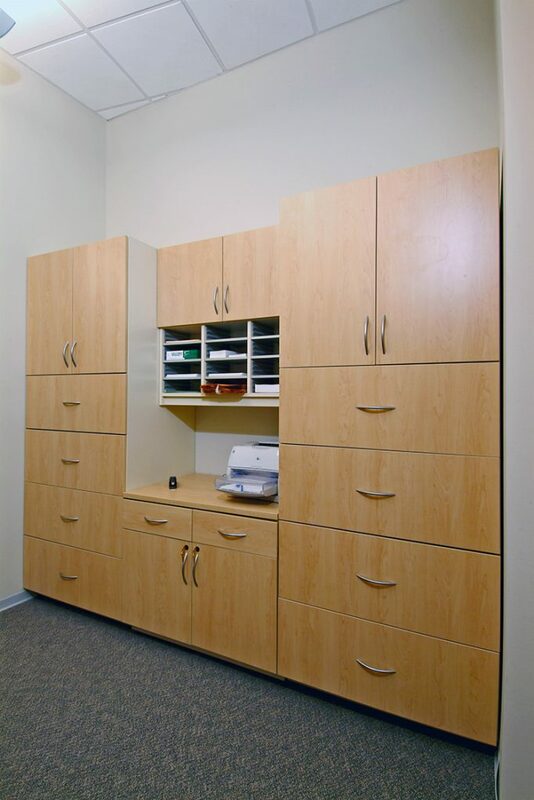 Shelves are available in four different sizes, are fully adjustable on 1-in. increments, and come in several colors or transparent. 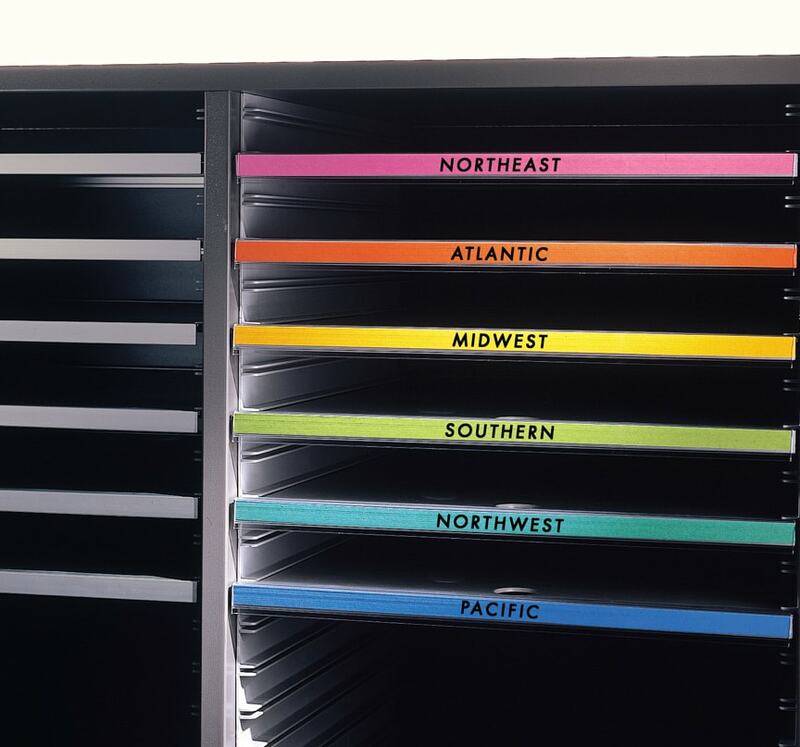 Shelf labels are the full shelf width and are supplied with labels for color coding. 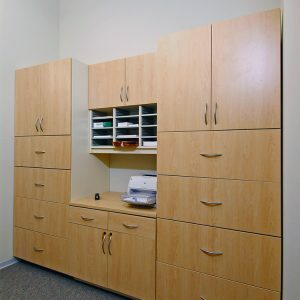 If you need a place to set your mailroom stuff, this is it. 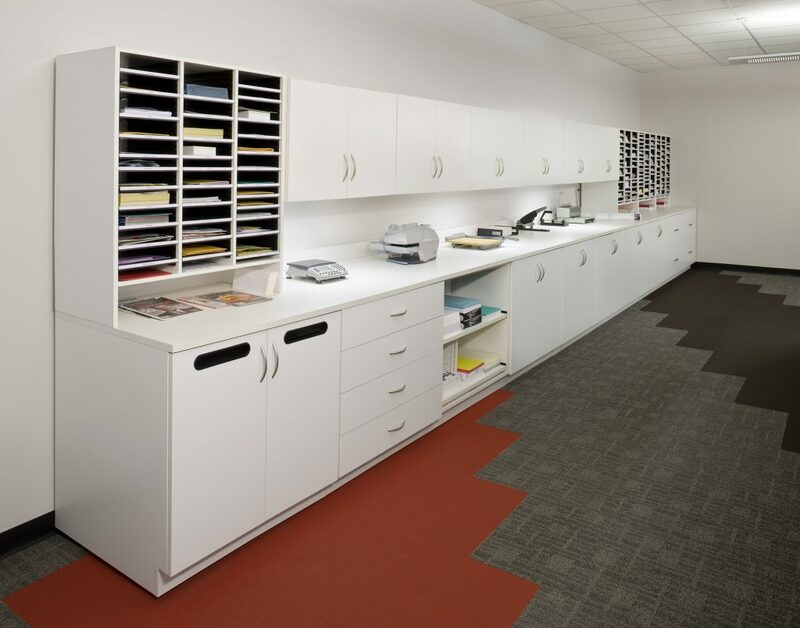 Contact us today for product information or to schedule a space planning analysis. 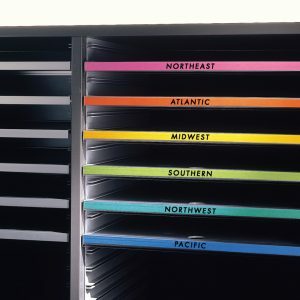 Despite companies’ efforts to move towards making the concept of “paperless offices” a reality, in truth there will always be paper. 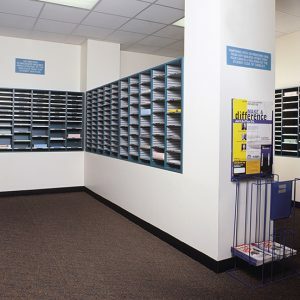 Certainly in mailrooms across the country, there are letters and packages and flyers and bundles galore. 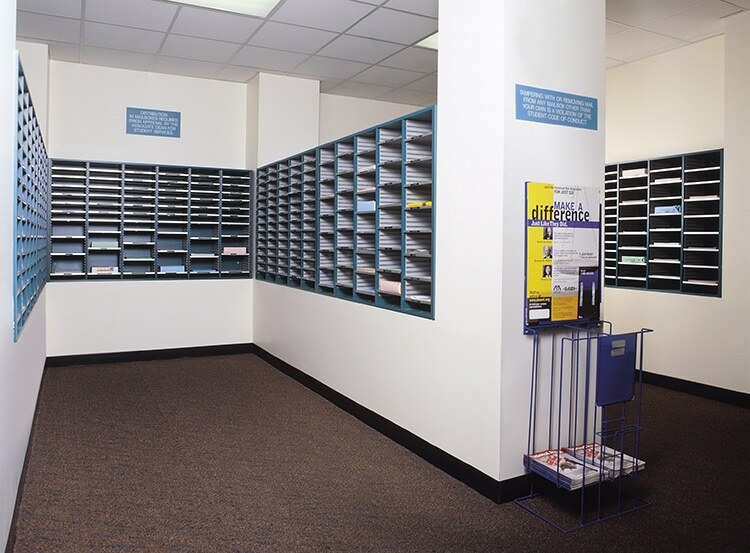 Keeping people organized begins with keeping their communications in order, and that begins in the mailroom. 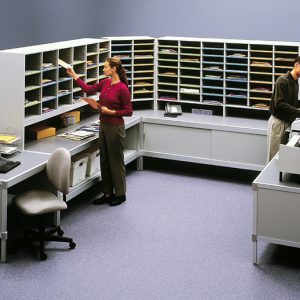 Whether it’s large aluminum consoles or sort modules, keeping correspondence and important information – incoming and outgoing – in order is an essential step in assuring that the right information gets to the right place. 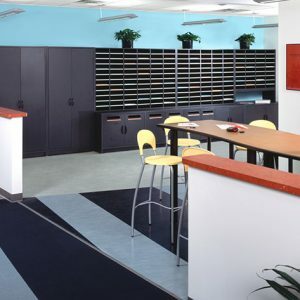 Durability and flexibility in mailroom furniture might not be the more exciting aspect of running a business, but it’s as vital a part as any other. 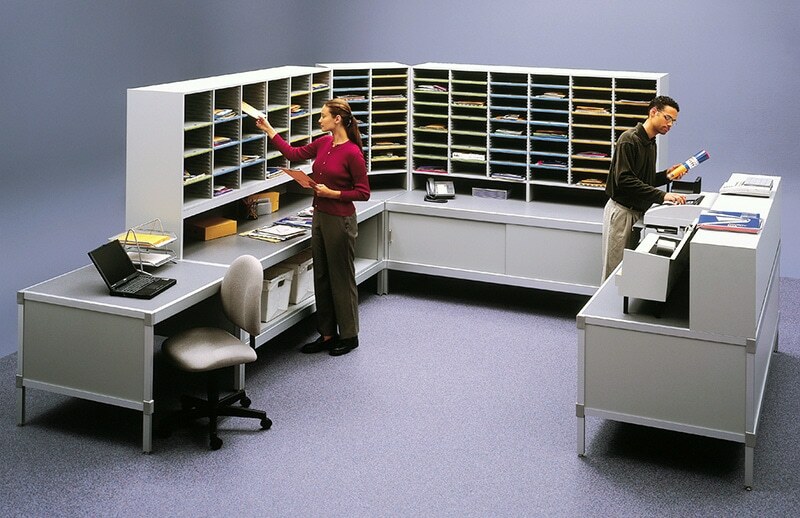 Choosing the mailroom furniture to get the job done can have immediate effects on productivity.